Japan on Monday revealed the name of the era as “Reiwa,” which will define the new emperor’s reign when he ascends the Chrysanthemum Throne next month following a historic abdication. After weeks of fevered speculation and top-secret discussions, the two “kanji” characters were unveiled to reveal a name that will last as long as new emperor Naruhito’s rule. 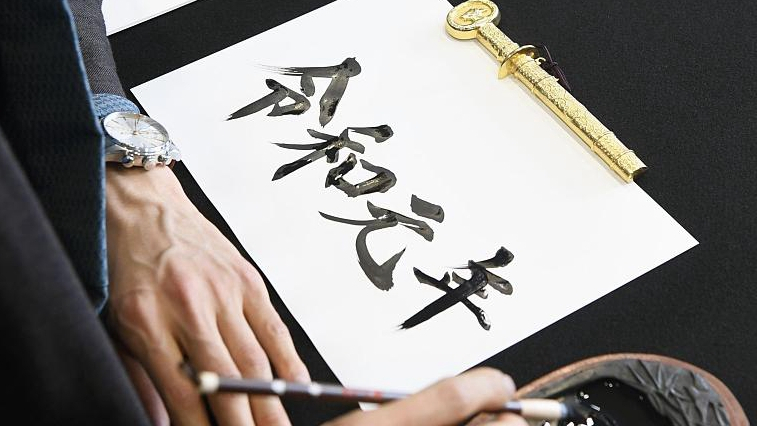 It may appear arcane to outsiders, but the announcement of a new era name is a massive event in Japan, marked with special newspaper editions, calligraphy shows and public festivities. Although the Gregorian calendar is widely used in the world’s third-largest economy, Japan is the only country still using Chinese-style imperial calendars for private and public documents as well as computer records. The new name therefore has a huge impact on daily life and people tend to recall major events in public and private life by when they fell in a certain era, 2019 is known as Heisei 31, or the 31st year of current Emperor Akihito’s rule. The era name must adhere to strict guidelines. It should consist of only two characters, be easy to read and write, and not employ common names or the first character of any of the last four eras: Heisei, Showa, Taisho and Meiji. Company names are excluded as well as the most popular choices in private guessing competitions, amid widespread speculation online as to what the new name could be. To prevent leaks, the panel were locked away in a special room in the prime minister’s office, swept for bugs, and their phones confiscated. The 85-year-old Akihito will become the first Japanese monarch to abdicate in around two centuries when he steps down on April 30 in favor of Crown Prince Naruhito, who will ascend the throne the next day. Japan is marking the announcement of the new era in a wide variety of ways, some less serious than others. A sake company is offering a vintage bottle from the first year of the Heisei era (1989) to anyone who correctly guesses the new name, while a grand hotel is marking the occasion with a three-kilogram wagyu beef burger served between gold-dusted buns for an eye-watering $900. Japan has had nearly 250 eras or “gengo” since adopting the system in the 7th century, and in recent times, one era has run the entire length of a monarch’s rule. But the announcement of a new era is a real headache for calendar publishers featuring both Western and imperial dates, while central and local governments must scramble to change dates on official documents. The tech sector is also bracing for the transition, amid fears there could be a computer glitch similar to the “Y2K” bug that sparked concerns ahead of the year 2000. Others view the change in era name as a bonanza. For example, companies that manufacture private ink seals, commonly used in Japan to sign official documents, are expected to benefit and they have already reported strong advance orders. Financial traders are also pinning their hopes on the new era name to bolster a shaky market. “New era-related shares such as printing companies have already been bought widely,” said Toshikazu Horiuchi, a broker at IwaiCosmo Securities. “We hope this festive sentiment will boost the entire market,” he added.